Special Containment Procedures: Outside of testing conditions, the individual components of SCP-525 must be stored in separate sealed containers. No more than six components may be stored in the same room or within 15 meters of each other. All currently-existing components are accounted for at Storage Site-23 in lockers ██ to ██. Only Class D personnel are authorized to handle SCP-525. All supervising staff must wear protective eyewear during testing. Description: SCP-525 consists of multiple disjoined arthropod legs, 10-15 cm in length. DNA identification has been inconclusive, but the closest match so far is to the brown recluse spider Loxosceles reclusa. The base of each leg ends in several minute hooks capable of perforating flesh. SCP-525 is covered in short, fine hairs, and is quite brittle. When alone or in proximity with fewer than six others, SCP-525 is inert. When eight components of SCP-525 are brought within range of each other (approx. 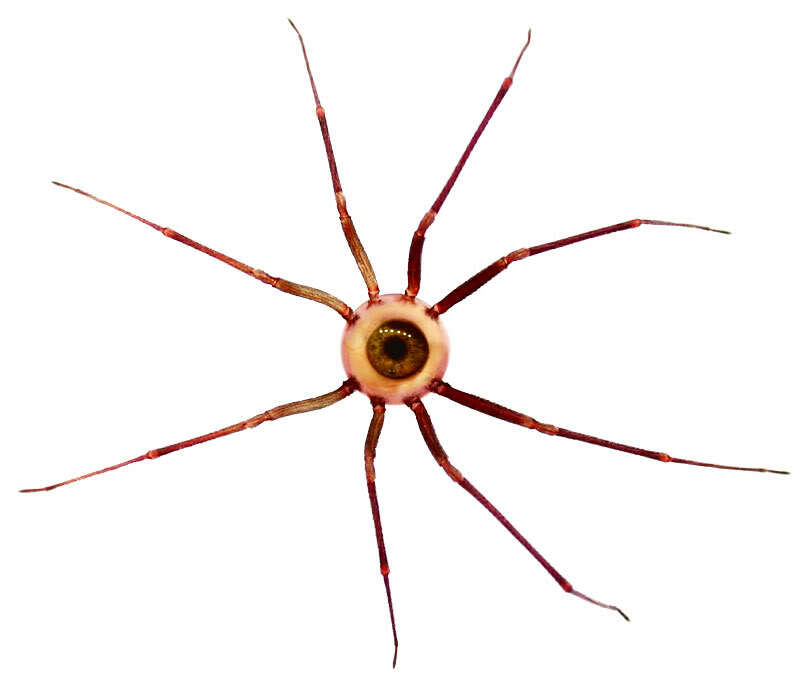 0.6m), the legs will immediately crawl into a group and attach themselves into a single entity, referred to as 525-1. At this stage, the speed of its locomotion greatly increases, and it will attempt to make contact with the closest human or similar (see Addendum #525-A). When a suitable animal is found, 525-1 will climb directly towards the animal's eye. Having centered itself over a socket, four legs will secure the eyelid while the others extract the eye. Despite 525-1's rapid movements, extreme care is taken not to damage the eye during the extraction, [DATA EXPUNGED] severing the optic nerves and central retinal vein. Once the eye is free from the original owner's socket, 525-1 will implant the base of each leg into the eye. Close inspection shows that the hooks at the base extend, effectively rooting the leg in position. If allowed to remain, 525-1 will lay what appear to be eggs in the socket of its host before climbing off (see Document #525-A). When in possession of an eye, 525-1 is no longer hostile and its movement is somewhat impeded. Curiously, 525-1 does not respond to visual stimuli, suggesting that it does not use the eye for sight. Dissection of a chimpanzee eye taken by 525-1 and retained for a period of one week revealed the formation of [DATA EXPUNGED]. Over time, the eye dehydrates, eventually turning the same reddish colour as SCP-525. After 2-3 weeks, 525-1 will abandon the eye and begin to search for another. Addendum #525-A: 525 responds to most large- to moderate-sized mammals. Reptiles, fish, and birds have provoked little response. When exposed to Crocodylus acutus, 525-1 attempted extraction, managing to blind the animal but otherwise failing. Thereafter, all instances of 525 have not responded to crocodiles, even those not present at the initial experiment. Document #525-A: Observation log of Subject D-1548 after exposure to 525-1. Report compiled by Dr. Weiss, dated ██/██/20██. Week 1: Medical staff on hand attend to D-1548. Fourteen ovoids resembling opaque toad eggs discovered embedded in the extraocular muscles. Three are removed and sent to the research lab. D-1548 placed under quarantine. Week 2: D-1548's injury is healing as normal. Eggs show marginal swelling. D-1548 does not display unusual discomfort. Eggs stored in the lab have deliquesced. Week 3: D-1548 complains of increasing "phantom pressure" in the socket. D-1548 demands a mirror to inspect the injury (request denied). Muscle tissue has healed over and obscured the eggs.